Map Samples - 2012 Maps of the Month - Maps & Facts Unlimited, Inc. This month's map is from CoStar's warehouse database for fourth quarter 2011. It does not include flex industrial. While the media is reporting that big box industrial supply is almost gone, the bulk of the industrial inventory is under 50,000 square feet. The overall 4th Quarter 2011 vacancy rate was 12.6%. One year ago it was 14.9%. Assessed Values: Proxy for Bottom? The 2013 projections are based on sales prior to January 1, 2012; say 2011. 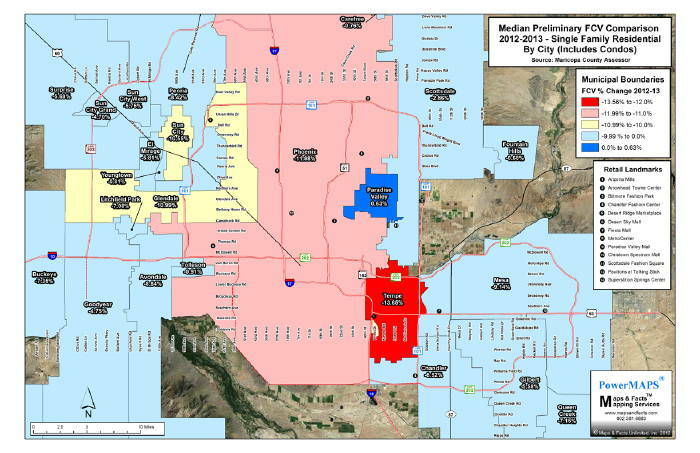 Maricopa County property owners can appeal by April 17, 2012, or, appeal to the Tax Court by December 15, 2012. New Criteria for Class "A"? 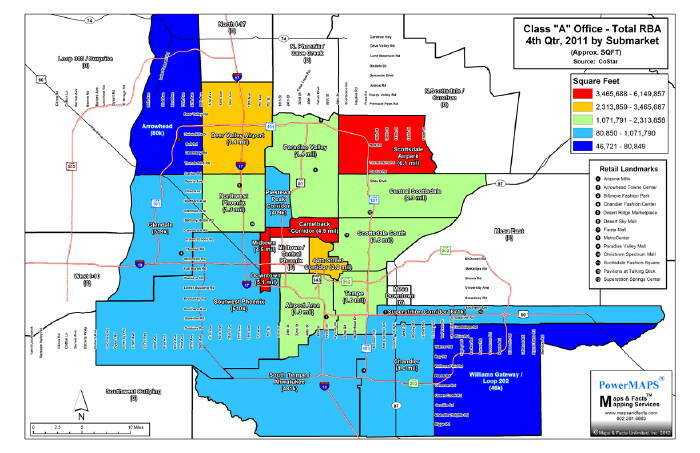 This month’s map depicts Metro Phoenix’s Class “A” office concentrations. CoStar and others define Class “A” as an excellent location; investment grade; highest quality; above average rents; and, built in the last 5 to 10 years. 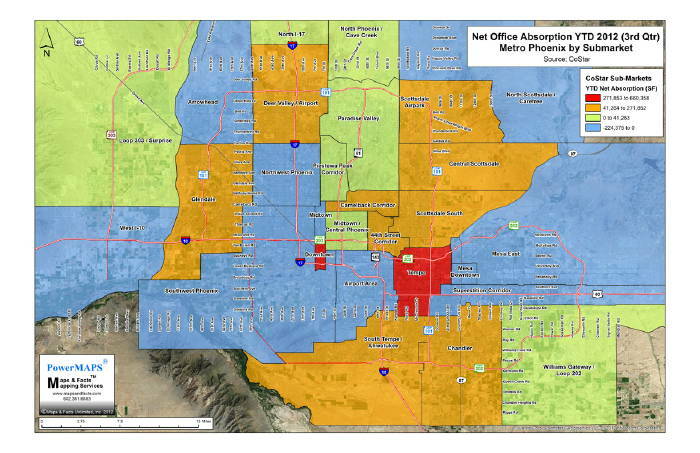 The newest Class “A” office buildings are in the Scottsdale Airpark submarket; now also the largest concentration. However, in order to maintain their Class “A” ranking over the next 10 years, owners of existing Class “A” buildings, especially in the older submarkets, will soon have to embark on major renovations. A tall order when effective Class “A” rents are at historic “B” and “C” levels. Or, the definition of Class "A" will have to change! We have long been critical of three mile “ring” analyses. Instead, we rely on what we call “True Trade Area" analysis based on demographics, not distance. 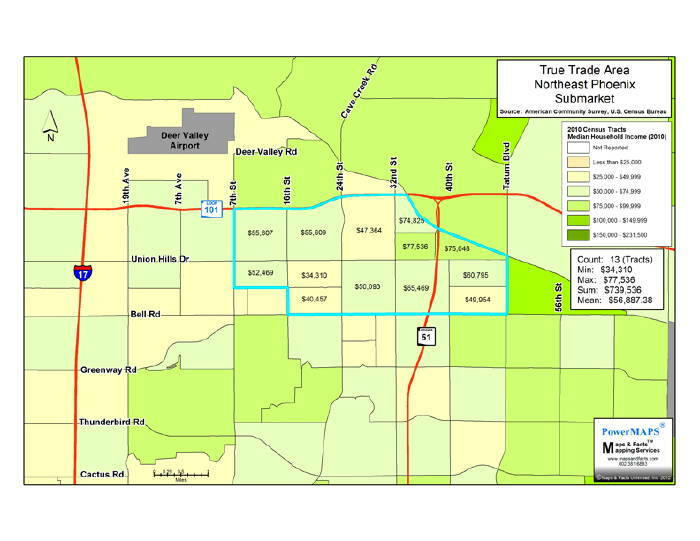 This month’s map is a simple example of True Trade area analysis based on similar demographic characteristics by Census Tract. The True Trade Area is outlined in blue. With graduations upon us in spades, we were curious as to the Valley-wide High School Graduation Rates. 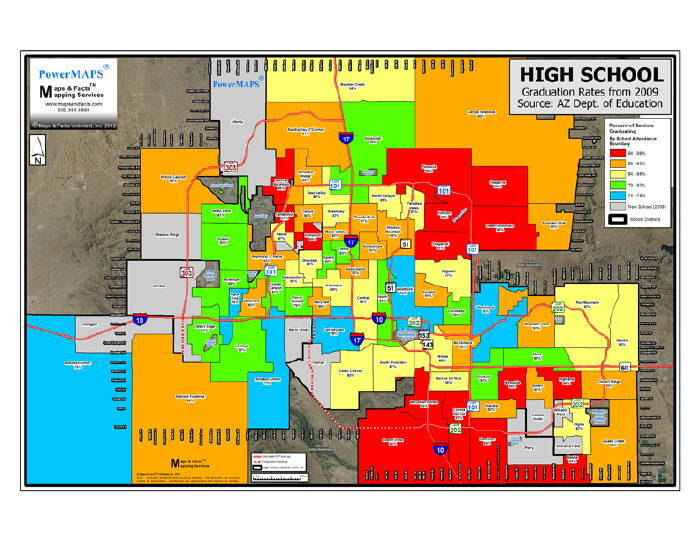 According to the Arizona Department of Education, 2009 represents the latest data available. Thus, this month's map. We were encouraged to observe that the lowest rate was 74% (Camelback High) and that 14 High Schools exceeded 93% with Desert Vista in Ahwatukee / Mountain Park Ranch at 98%! There are too many things happening at once to get a meaningful housing price index: Investors, Short Sales, Foreclosures, Bank Owned, and so on. This month we tried to focus on the average house representing the average home owner. We calculated the median and average sale price for all houses built between 1990 and 1999 which sold for between $100,000 and $1,000,000 during the last 6 full years (2006-2011). The results are shown below and each year is depicted on the following maps. As seen, prices continue to decline, for this market segment, Valley-wide. We still have a long way to go before cost equals value! One problem with Census Data is that is shows where people sleep; not where they work! With the kind assistance of MAG, we have combined MAG's census tract employment estimates (employers with 5 or more employees) with Uncle Sam's 2010 census population counts, to display estimated daytime and night time populations. Obviously, there is a "commuter shed" that may distort these numbers, but less so in the denser tracts and "Village Cores". 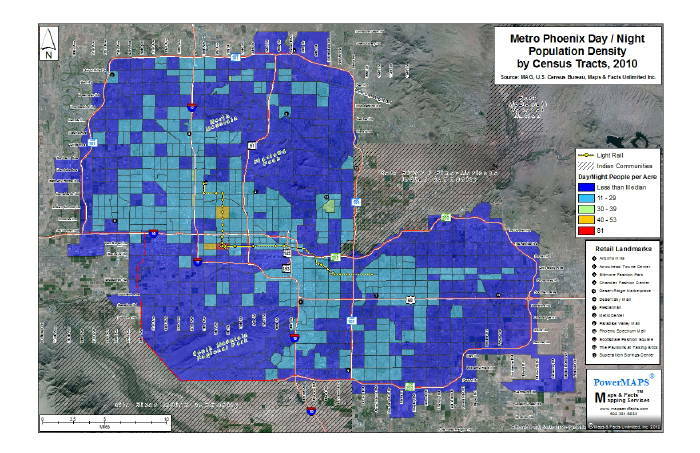 Metro Phoenix "Inside the Loops" densities range from less than 1 to 81. 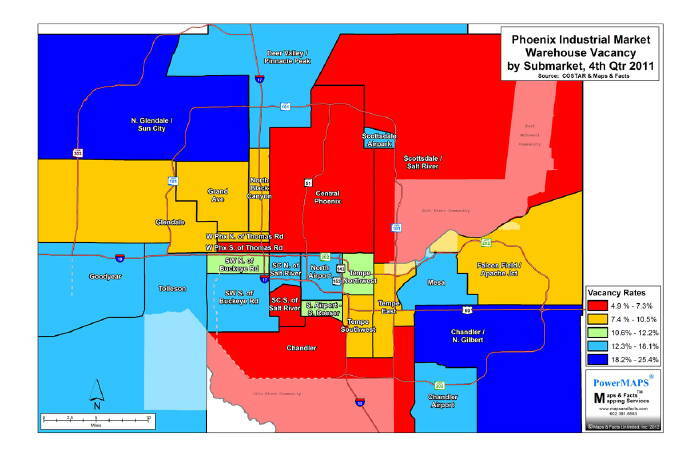 As shown, there is only one tract with 81 and that is downtown Phoenix. The next highest is 53 and the median is 10. 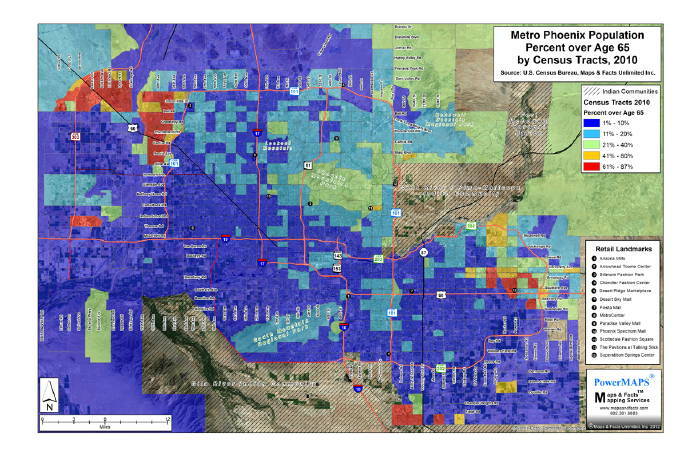 This month’s map shows the Number of Households (people) multiplied by Median Household Income divided by Number of Square Miles (per census tract) and suggests where the dollars are by census tract clusters. 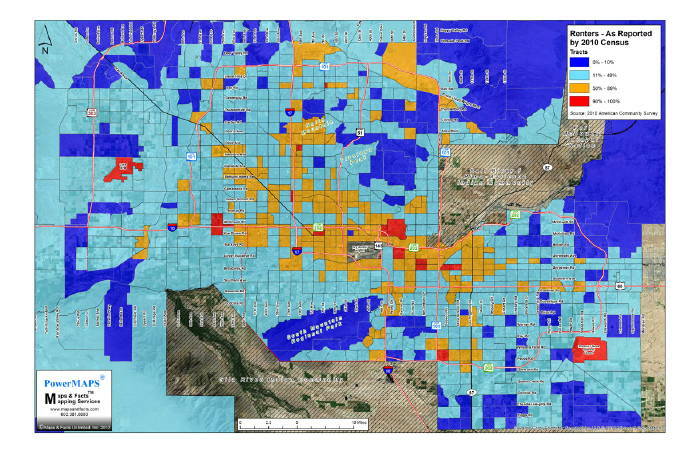 We recently researched “housing unit occupancy” based on the 2010 American Community Survey (Census Bureau) and were intrigued to see the pattern as depicted on this months Map of the Month. Valley wide, 33% of households rent: pretty consistent with historic housing type ratios, i.e. : 60% SF; 30% MF, and 10% TH/Condo. However, it is interesting to see the geographic distribution of renters, and inversely, owners. We expected more renters in the distressed submarkets favored by investors; but that doesn’t appear to be the case. Considering that the survey was taken in 2010, it maybe that investor owned rentals hadn’t shown up yet, or, there weren’t as many as thought? We will watch for updated survey data in the Bureau’s “ACS” which is published every year for select demographics. We try hard every month to find good news! But it's tough. This month, we have noticed positive references to office vacancy and absorption. While there are some discrepancies, CoStar now has Valley wide vacancies at 20% . This month's map also identifies the most active office submarkets i.e. 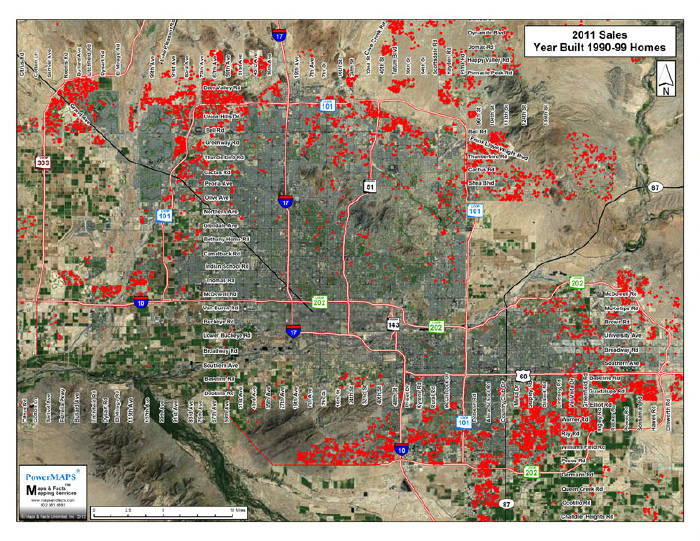 : Downtown Phoenix and Tempe, Downtown also had 695,000 SF of "deliveries" i.e. : new inventory and mostly government. Valley-wide, we actually added 2,447,427 SF of occupancy; however, we also lost 797,663 SF for a net increase of 1,649,764 SF but over 600,000 SF included government buildings Downtown. Office rents are still well below cost new. We recently researched sites for various age related development and was surprised to see that not much has changed since the 2000 census. 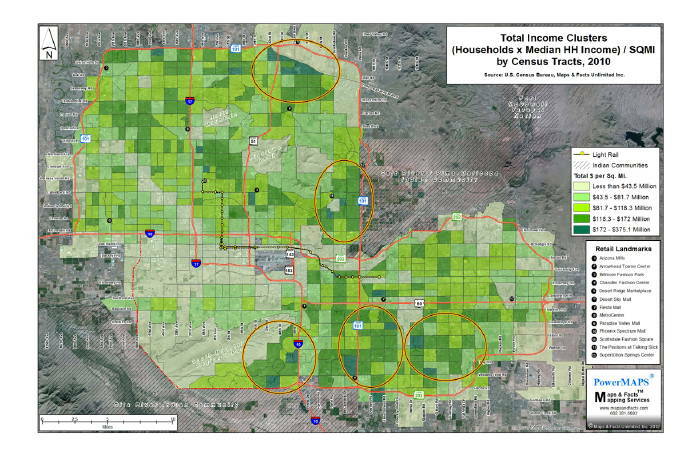 As this month's map shows, the 65+ cohort is still concentrated in the Sun Cities and East Mesa. We expected to see more Silver Surfers "inside the Loops", and certainly more than 10 years ago. We recently had occasion to learn more about Medical Marijuana Dispensaries and since the subject has been in the news lately we thought you might be interested in the information we found. 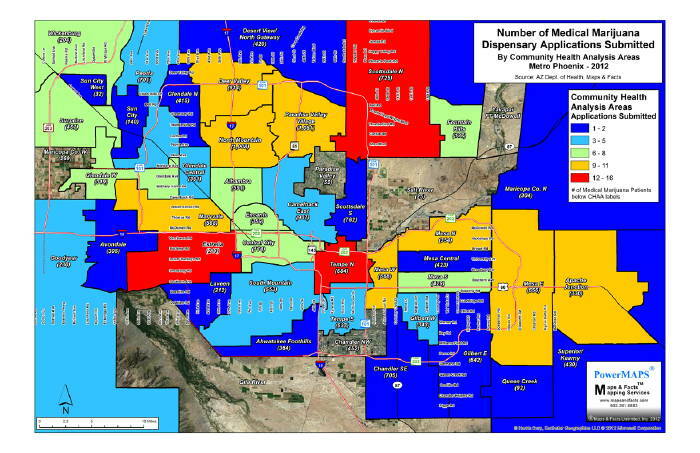 This months map's color legend depicts the long established State Community Health Analysis Areas (CHAA) which have been selected to serve as the geography for future dispensaries. The legend also indicates the number of dispensary applications for each CHAA. However, only 1 Medical Marijuana Dispensary will be selected by lottery for each CHAA. Two (2) CHAA's (Paradise Valley & Chandler NW) have no applicants. The number in parentheses indicate the number of Medical Marijuana patients (Cardholders) in each CHAA to date. So, if you live in PV you'll have to go to Scottsdale to get your meds!